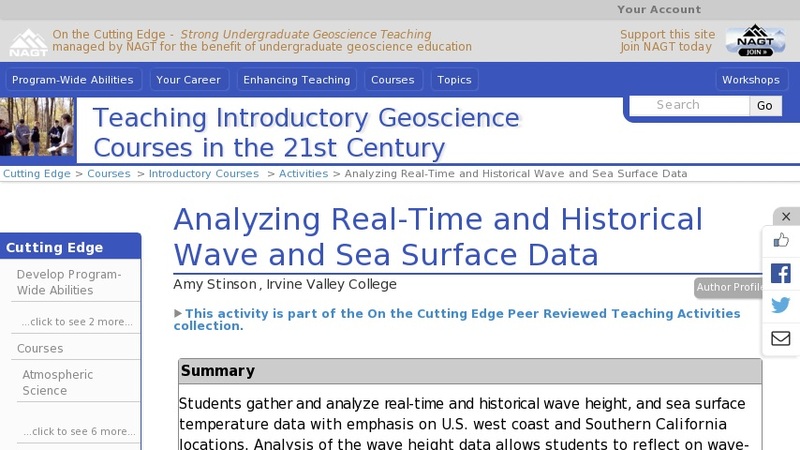 In preparation for this lab activity, students have read the textbook material on Waves (Garrison, 6th ed., Oceanography), and attended a lecture on the same topic. In class, students will access Coastal Data Information Program (CDIP) data published by the Ocean Engineering Research Group, Center for Coastal Studies, Scripps Institute of Oceanography. Students will compile specific real-time wave and sea surface temperature data sets as specified in the lab assignment. This requires students to generate and interpret multiple graphs from the available data, set-up their own system of data acquisition, and interpret the wave height and sea surface data in the context of the local physical oceanographic parameters.